options and request a quote. The Roland VersaStudio BN-20 packs everything into one, powerful, profit-producing package. With award-winning eco-solvent inks including metallic and white options, a range of material compatibility and integrated contour cutting, the BN-20 is easily the most versatile print device in its class. The Roland VersaStudio BN-20 is perfect for creating t-shirt graphics, poster prints, stickers and decals – all from the comfort of your desktop. Not only does the Roland VersaStudio BN-20 desktop inkjet printer/cutter open up a world of graphics possibilities, but it does it with the highest level of quality. Featuring a piezo inkjet print head that prints up to 1440 dpi, the BN-20 delivers exceptional quality prints with smoother gradations, richer density and deeper image saturation for photographic and vector output. The VersaStudio streamlines the production process by automatically contour cutting its printed output and eliminating the need to reload and reposition graphics. For laminated graphics, our Quadralign® four-point optical registration system allows users to remove prints, laminate and reload them for cutting. Quadralign automatically realigns the cutting path and compensates for skew and distortion. All functionality of the Roland VersaStudio BN-20 is handled through included software which controls basic machine functions, status and calibrations. An intuitive device, the Roland VersaStudio BN-20 simplifies print production and helps users easily manage output and costs by monitoring replacement of consumable parts like wipers and contour cutting blades. Roland Eco-Sol MAX ink offers fast drying time, high density, a wide color gamut, rugged scratch resistance, a low cost per square foot and broad media support. 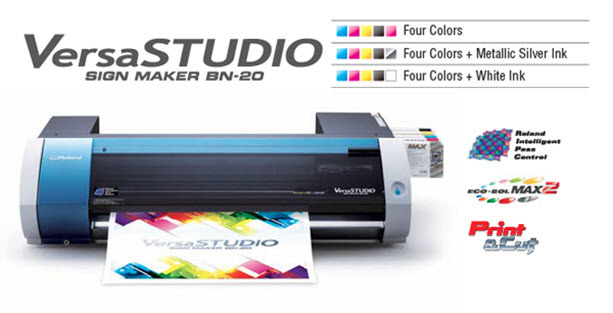 The Roland VersaStudio BN-20 can be set up in for printing both standard and luxury items. You can print in standard CMYK, CMYK+W, For use with clear or colored media on packaging comps, labels, window signs, and other popular applications, white ink can be printed as a spot color or an undercoat to increase the brightness and opacity of full-color images. CMYK+Mt (Metallic Silver), the metallic silver can be printed as a spot color or combined with CMYK to produce over 500 striking metallic and pearlescent colors, including Roland’s Metallic Texture Library of different texture fills. There is also CMYK (aqueous ink) available which is a high-density water-based ink that creates brilliant colors and excellent print quality for short-term indoor applications. Combined with 300 gram cutting capability, the integrated contour cutting of the Roland VersaStudio BN-20 is consistent and virtually eliminates common problems inherent in drag knife technology with simple up/down electronic controls. Ingenious cutting carriage technology prevents bounce against the media if the force is set too high for the substrate. Built with Roland’s legendary reliability, the Roland VersaStudio BN-20 features a gold-plated head to reduce static and prevent clogging and a patent-pending wiper system to decrease wear and tear on the print head and prolong its life by reducing buildup. A patent-pending automated Ink Circulation System reduces waste, for dramatically lower running costs while ensuring exceptional image quality over the long term. A simplified media feed system automatically aligns roll media for printing. This intuitive system detects and adjusts the pinch roll wheels to the width of the installed media, ensuring proper placement and tracking. The Roland VersaStudio BN-20 supports roll media from 6 inches up to 20 inches in width and weighing up to 13 pounds. R-works is an entry-level design package that allows users to import photos and images for insertion into design layouts for creating custom print and cut graphics, and also includes a vector art library of stock designs. Also included is Roland VersaWorks 6, featuring the latest HARLEQUIN dual-core engine for faster processing times, this easy-to-use RIP software is the hub of production for the Roland VersaStudio BN-20 and allows even novice users to take full advantage of advanced capabilities. Proving that powerful doesn't have to mean complicated, VersaWorks 6 offers intelligent and predictive features to make printing and cutting so much easier. With a newly designed drag-and-drop interface, native 64-bit processing, predictive ink calculator estimates the amount of ink needed, and all the tiling, nesting, variable data, color profiling, and other advanced tools that have made VersaWorks the preferred software of print and graphics professionals. We have additional Introduction and Training Videos for the Roland VersaStudio BN-20. The Roland VersaStudio BN-20 packs everything into one, powerful, profit-producing package. With award-winning eco-solvent inks including metallic and white options, a range of material compatibility and integrated contour cutting, the Roland VersaStudio BN-20 is easily the most versatile print device in its class. The BN-20 is perfect for creating t-shirt graphics, poster prints, stickers and decals – all from the comfort of your desktop. Not only does the Roland VersaStudio BN-20 desktop inkjet printer/cutter open up a world of graphics possibilities, but it does it with the highest level of quality. Featuring a piezo inkjet print head that prints up to 1440 dpi, the Roland VersaStudio BN-20 delivers exceptional quality prints with smoother gradations, richer density and deeper image saturation for photographic and vector output. All functionality of the Roland VersaStudio BN-20 is handled through included software which controls basic machine functions, status, and calibrations. An intuitive device, the Roland VersaStudio BN-20 simplifies print production and helps users easily manage output and costs by monitoring the replacement of consumable parts like wipers and contour cutting blades. Combined with 300-gram cutting capability, the integrated contour cutting of the Roland VersaStudio BN-20 is consistent and virtually eliminates common problems inherent in drag knife technology with simple up/down electronic controls. Ingenious cutting carriage technology prevents bounce against the media if the force is set too high for the substrate. R-works is an entry-level design package that allows users to import photos and images for insertion into design layouts for creating custom print and cut graphics, and also includes a vector art library of stock designs. Also included is Roland VersaWorks 6, featuring the latest HARLEQUIN dual-core engine for faster processing times, this easy-to-use RIP software is the hub of production for the BN-20 and allows even novice users to take full advantage of advanced capabilities. Proving that powerful doesn't have to mean complicated, VersaWorks 6 offers intelligent and predictive features to make printing and cutting so much easier. With a newly designed drag-and-drop interface, native 64-bit processing, predictive ink calculator estimates the amount of ink needed, and all the tiling, nesting, variable data, color profiling, and other advanced tools that have made VersaWorks the preferred software of print and graphics professionals. The Roland VersaStudio BN-20 comes with the Energy Star® seal of approval. It's your guarantee of maximum energy efficiency and lower electric bills. Energy Star is a government-backed program that helps businesses and individuals protect the environment through superior energy efficiency. The VersaStudio Roland VersaStudio BN-20 is warranted for a period of one year, including parts and labor. Roland’s international ISO certifications are your assurance of quality and reliability backed by first-rate customer service and technical support. Distance accuracy (when printing) Error of less than ± 0.3 % of distance traveled, or ± 0.3mm (0.012 in), whichever is greater. Distance accuracy (when cutting) Error of less than ± 0.4 % of distance traveled, or ± 0.3mm (0.012 in), whichever is greater. Included Items Power cord, USB cable, blade, blade holder, Roland Software Package 9, Software RIP (VersaWorks), User's Manual, etc. Please note: Considering that you will be using software such as Illustrator, we recommend that you use as high performance computer as possible to reduce RIP processing time. We also recommend using a hard disk that has large enough capacity, as print files are often tens of GB in size (or larger) when data is high resolution.